Since 2002, Kingdom Hearts has been one of Square Enix’s premiere franchises. Spanning several games and platforms even in other mediums, the series and its risky blend of Final Fantasy and Disney properties has earned it a place among some of the more iconic works in gaming. Two mainline entries and several handheld spin-offs later, we’re now faced with Kingdom Hearts 3D [Dream Drop Distance] for the 3DS – which is being touted as the true follow-up to KHII. Without a proper “III” in sight, is 3D a worthy entry to the series? Or has the Kingdom Hearts series dropped quite a distance? The game picks up where Kingdom Hearts II and Re:Coded left off, revealing the contents of the message Mickey sent to Destiny Islands. 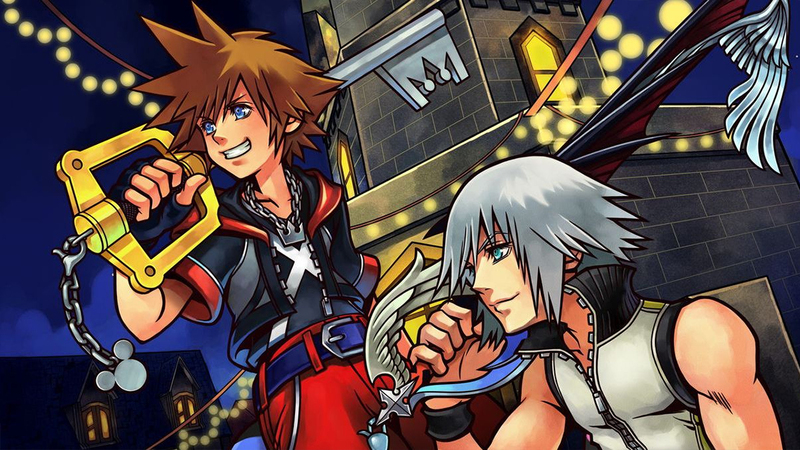 Sora and Riku are then thrust into the Mark of Mastery exam, a test with the passing reward of becoming a Keyblade master. From there, the duo enter the world of dreams, where they will come across all new Disney lands and characters. As with most of the games in the series, Dream Drop Distance is a relatively standard action RPG. You can attack, jump and use magic or physical techniques all in real time. The technique system utilizes the advancements made in Birth By Sleep; opting for a cool-down system rather than relying on MP. A limited number of techniques and magic can be equipped at a time, that number increasing at various portions throughout the game. One of the more innovative additions to the game is a trick-based system known as “Flowmotion.” This adds a new level of depth to the combat. With a simple press of the Y button, Sora and Riku can do a dash either on the ground or in air. Coming into contact with certain objects or even enemies while in this dash state allow for some interesting acrobatic techniques. For example, dashing into a wall allows you to bounce off said wall, which in turn brings about a new attack option. Whether it’s swinging around on a pole to attack several enemies at once, or skating on a guard rail to travel faster; Flowmotion is a vital mechanic that should be used in a variety of situations. While combat itself has been seemingly streamlined in that regard, lack of Command Deck options which were present in Birth by Sleep seem like a step backwards. Sorely missing is the D-Link system from that game, and the ability to really have absolute freedom when developing the combat for your character. KH3D has taken a bit of a dumbed down approach to where character progression has become linear and restricted. It’s a really puzzling decision considering the same team worked on both games. On the other hand, Flowmotion essentially acts as a double-edged sword for the game’s platforming elements. While those same elements have, for the most part, always been secondary in the series, Flowmotion completely takes the challenge out of them. The mechanic gives you an unprecedented ability to reach new places, allowing the player to jump indefinitely when near any kind of structure. Certain jumping techniques obtained later in the game feel completely useless thanks to this. To make up for the total freedom in air, separate areas are restricted via invisible walls and the character’s unwillingness to explore until the player advances the story. While not inherently bad, there are rough spots that make it feel as though the game is still designed around the platforming elements of previous games, which is completely incompatible with the level of freedom you get from Flowmotion. Dream Drop Distance’s biggest flaw is arguably the camera. First and foremost, it is too zoomed in. The camera in Birth by Sleep had a similar distance position, but was justified with smaller zones. Here, the areas seem to be about as big as they are in their console counterparts. To make matters worse, it’s hard to get it in just the right position. When you’re zipping around using Flowmotion, the camera seems to have a lot of trouble keeping up – the panning controls are just too sensitive. It’s definitely manageable and something most people would get used to, but it’s also not something that should require a learning curve. By far the worst problem with the camera appears during any large enemy fight – particularly with boss battles. Often times you can’t see where you’re supposed to be going, even with the lock on feature engaged. As expected, this leads to some very frustrating moments. An interesting addition to the world mechanics in the game are the “Reality Shifts.” By pressing A and X at the same time in the vicinity of certain objects, you can freeze time and interact with the object in different ways on the touch-screen. The Reality Shifts could be as simple as catapulting a barrel into a group of enemies, or as complex as a scaled down rhythm game. If the conditions are right, even boss enemies can be victim to this unique mechanic. Another new feature are the “Dream Eaters” – A.I. controlled partners replacing Donald and Goofy or other summons. Several Dream Eaters can be created through obtaining recipes and materials, with only two allowed on the field at a time and an extra one in queue. They can of course be leveled up and taught techniques via their own specialized grid. As cute as the Pokemon-like creatures are, their uses are relatively limited – most of the time, the Dream Eater’s assistance will be completely unnecessary. That isn’t to say they can’t be an asset given the right situation, but more often than not, the most you can get out of them are competent healers. However, the Dream Eaters do come into play in a very addictive mini-game known as Flick Rush. This games pits 3 of the player’s Dream Eaters against 3 of the opponent’s in a unique card/RPG hybrid. The object is to send numbered cards on the touch-screen up to the top-screen. These cards serve as different attacks and whoever has the higher number will neutralize their opponent’s attack. Sending more cards out at once will increase the number, but also leave you with fewer cards, forcing you to switch out your Dream Eater with another one. While on the surface, Flick Rush appears to be a simple high-number reliant card game, the amount of depth and strategies that have to be made and executed on the fly really causes this mini-game to stand out as one of the best the series has seen. Really, it could be a game all on its own. Other Dream Eater mini-games include a sort of AR petting and feeding game, where you can literally rub your pet and take photos to help it level up and gain skills. You can also toss various food items to them, and even play balloon tapping games. It’s not necessarily a bad idea in concept, but goes back to the problem of the creatures themselves being too limited and comes off as a bit of a gimmick. A particularly hit or miss function is the “Drop” system. Since you will never be controlling Sora and Riku at the same time, the system was implemented as a way to switch between the two. The kicker is “Drops” happen automatically when the Drop gauge depletes, essentially giving you a time limit with each character before they are swapped with the other one. Yes, you can Drop manually, but it is not recommended, as you can build up points to enhance the abilities of the other character when finally switching. Despite being pretty unique, the system just comes off as annoying in many situations, serving to interrupt whatever task you were in the middle of. And of course, the Drop always seem to rear its ugly head right in the middle of a boss fight, completely undoing any damage you inflicted. Yes, there are items to either slow or increase the Drop gauge, but it just feels as if you’re buying an item to fix what is a shoddy mechanic in the first place. The story of the series has always garnered its fair share of criticism for a variety of reasons – those of which are still present in Dream Drop Distance. With an oddly entertaining dose of convolution, the plot arguably takes the confusing narrative to new heights. I won’t go into details to avoid spoilers, but the combination of difficult to pull off story threads such as dreams and another infamous plot element makes this a hard sell for people that either aren’t already a fan of the story, or can’t look past some outlandish scenarios. The game also really just throws you in with very little explanation for the most part. And while the game does provide text summaries of the previous Kingdom Hearts games, the story in 3D is really just static – it’s blended together with very little motivation, even across the different Disney worlds. While of course the worlds themselves are interesting – they really felt more like icing on a hollow cake when it came to the narrative. Slogging along through the plot can sometimes be tiresome and dives further into nonsensical outcomes that are quite frustrating. For fans of the narrative, the plot is relatively hit or miss. While it does further the lore and has some significant revelations, those expecting the content of a numbered game or even Birth by Sleep might feel a bit short-changed. While billed as a mainline entry in the franchise, it feels like more of a side-story than anything else. With rehashed villains and a feeling that not much outside the dream worlds is really being affected, the plot is essentially meant to be taken as build-up for the inevitable Kingdom Hearts III, if that is indeed the next “mainline” entry. Graphically, KH3D is a mighty impressive showcase of the 3DS system’s capabilities. Larger levels with details similar to their PS2 counterparts, the game does well to present itself on a handheld. Mouth and character animations might be some of the best in the series so far. The choice of Disney worlds this time around might not be the greatest, but it’s refreshing to see new ideas come out of the likes of The Grid (Tron Legacy) and Symphony of Sorcery (Fantasia). While the amount of worlds present might not be as large as some of previous titles, the ones that exist feature much bigger levels and opportunities of exploration. The only downside to this is that each location is completely devoid of any NPCs and so the worlds seem empty and lifeless. Lack of a greater Disney presence also hurts the game, I feel. It would have been nice to see a lot more Disney related boss fights or even villains play into the story. But no, once again Xehanort decides to overshadow everything. The other area of great surprise comes from the layout of each world – each is presented different for both Sora and Riku so you’ll be able to enjoy difference experiences without having to worry about replaying the same level twice. Instead of Final Fantasy characters, Square Enix has opted to go with fan-favorite The World Ends With You – which is a unique spin on the world and characters from that game. Voice acting in KH3D is as solid as ever with series residents returning once again. Perhaps the only complaint is that Haley Joel Osment is getting a bit old to play Sora – or rather Sora’s younger self. Disney has once again cast original, or as close to the original voice actors for their own cast – a welcome feature that makes playing and reliving those Disney moments all the more magical. Despite some glaring flaws keeping it from greatness, Kingdom Hearts 3D [Dream Drop Distance] is an enjoyable addition to the series. The speedy and dynamic combat coupled with intense boss battles make this an appealing entry for some, but the poor camera controls and positioning, cumbersome systems, and a story that is as convoluted as it is inaccessible to newcomers makes this a tough sell for anyone that hasn’t followed the series from the beginning. Disclaimer: This review was based off final retail code of the English Nintendo 3DS version of Kingdom Hearts 3D [Dream Drop Distance] provided by Square Enix. Read more about the Nova Crystallis review policy here.